When I was little, I played on the deck with my dolls and stuffed animals, pretending they were children in my class. This is when I knew I was going to dedicate my life to educating children. My real journey began when I was a junior in high school. I took a child development class that required me to spend time in many of the local child care centers. During this time, I received information about an opportunity to take classes to receive a Child Development Associate Credential. I completed these classes while a senior in high school and received my high school diploma and this credential at the same time. I acquired a job at a local child care center that I worked for, for about 2 years and developed a dream to own my own center. In the midst of this dream, I began pursuing my teaching degree in 2002 to better understand and guide children. I received my Bachelor of Science in Education degree in 2006 from Black Hills State University. I received my first job in my career with the Rapid City School District and taught kindergarten there for 3 years, at this time I also received my Master of Arts in Teaching degree at Grand Canyon University. In 2009, I made a transition to the Douglas School District to teach first grade for 3 years then kindergarten and first-grade special education for 1 year, and finally Early Intervention, birth to age 5 for 4 years. In January 2017, I began fulfilling my dream to create Leap 2 Learn Educational Childcare, an early learning center that has a passion to create tomorrow’s future. I developed a strong belief that children learn through play, social interactions with peers and guidance from adults. I have spent 12 years teaching children by choosing activities, games, projects, lessons, and ideas that fit the child’s needs and individuality, while being guided by state standards or the South Dakota Early Learning Guidelines. By being able to also choose activities that fit the child’s interests, it ensures that the child will develop skills easier and maintain them because they are actively engaged and being scaffold in their development. I have brought this belief to the Leap 2 Learn programs. I believe in TEAMS…I believe in forming an environment that empowers my team to have a deep aspiration for educating children and their families while having fun and still being a kid at heart. 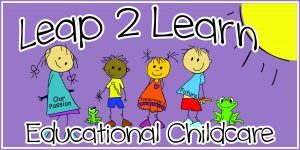 The team members that work at Leap 2 Learn will maintain professionalism and continuously communicate with families to ensure everyone is on the same page in the success of the child. You as a parent or family member are a large part of this team! So, let’s get to work in making great things happen with and for your child. I believe that all children can learn, so I stand with you in creating the best education possible for your child in their early learning years.